Mark Bowden has a new book coming out, which is extremely exciting. It's entitled Guests of the Ayatollah, and according to Barnes and Noble, it's about the Iranian Hostage Crisis of 1979 -1980, which is a subject that I've read a little about, but from the military standpoint. Bowden is the author behind Black Hawk Down, which is still one of favorite (that doesn't really seem to be the right word) war stories, because of it's intense detail. The book also looks to be very interesting, given today's interactions with the Middle East and Iran in paticular, which has been a subject that I've been gaining interest in, ever since we took a look at it in several of my politics classes over the past couple years. Anyone who has read Mark Bowden’s Black Hawk Down or Killing Pablo knows that he is capable of putting us in the heat of a story in a way few writers can. Road Work gathers the best of his award-winning writing, from his breakout stories for the Philadelphia Inquirer to his influential pieces in the Atlantic on the conflicts in Afghanistan and Iraq. 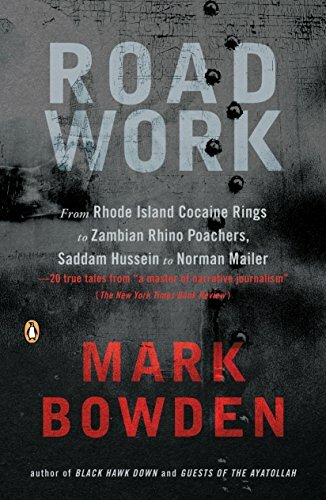 Whether traveling to Zambia, where a team of antipoachers fights to save the black rhino, to Guantánamo Bay to expose the controversial ways America is fighting its war on terror, or to a small town in Rhode Island to penetrate the largest cocaine ring in history, Bowden takes us down rough roads previously off limits—and gives us another gripping read. This one also looks like a good one to get, and I'll be keeping my eyes open for it.